I haven’t read Lying About Last Summer, Sue Wallman’s previous book, but after reading See How They Lie, I definitely will be. 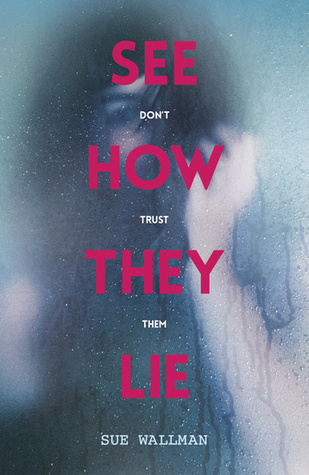 See How They Lie is shrouded in mystery that kept me wanting to read more and more. It starts slow, with little hints that something is not right in this medical facility that Mae has grown up in. Her father helps run Hummingbird Creek and Mae has little knowledge of the outside world. It’s obvious before you even open the book that here is a tale of deceit, unless you ignore titles when you open books. That starts in the opening chapter, but it isn’t until later that you begin to understand the extent of the lies. The slow pace coupled with the mystery of Hummingbird Creek works very well together. We know something’s not right, and we are more aware at the start than Mae is. Even though she suspects her parents lying to her she cannot guess the extent. That’s where this book really shines. It’s written in the first person, so we only see what Mae experiences. She has no knowledge of the outside world, the way she lives is normal to here. And as outsiders, we can see that Mae’s upbringing is far from normal. Slowly contact from the outside world unravels this mystery and the pieces start to slide together, but every time I thought I was figuring it out, something changes, something happens and I’m none the wiser. By the time everything is resolved in the final pages, I’d gone through several theories and didn’t guess the final resolution. The beginning of this novel is incredibly slow. After the hint of mystery in the first chapter, plot takes the backseat while building up the facility and Mae’s friends drive the story forward. That’s my biggest issue with this book. I really enjoyed the story, and the world built up in the facility but the opening is so slow that I was only reading a chapter at a time. It was worth it, and the twists later on make the opening bearable in hindsight. My other issue is one of the driving characters for the later half of the story. The teacher Ms Ray. She knows something is wrong with the facility and she is trying to help Mae find an escape through education. This state of the art facility is really lacking in it’s education, at least for staff kids. This is believable in the story as they are keeping them less informed and easier to control, the problem is why wouldn’t they sack Ms Ray. Why would they even hire her, if she didn’t fit in. I felt like Mae’s father would get rid of her once she upset the status quo which he notes at one point when he sees school text books on Mae’s shelf. Despite the slow opening, the mystery in See How They Lie is worth reading for. Towards the end, I couldn’t put it down. It’s easy to read, and a great example of how well first person narratives can be written. I look forward to reading Lying About Last Summer some point soon. This entry was posted in Uncategorized and tagged Author, Book reviews, Books, Mystery, Reading, YA, YA Book review, YA book reviews, YA books. Bookmark the permalink.